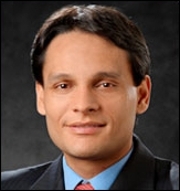 Felipe Lobelo, MD, PhD, associate professor in the Hubert Department of Global Health at Emory’s Rollins School of Public Health was recently appointed to the Action For Healthy Kids Board of Directors. Lobelo will join the board alongside a new board chair and three additional board members. Created in 2002 in response to 16th U.S. Surgeon General David Satcher’s public call to action, Action for Healthy Kids works with schools to fight the national epidemic of childhood obesity and poor health. The new members join an esteemed group of individuals who work across a variety of fields related to child and public health, nutrition, sports medicine, obesity and education and who are passionate about making a positive difference in the lives of students and schools nationwide. "I am honored to join the Action for Healthy Kids team and provide my contributions to the very important work that happens within this organization," says Lobelo. "I share in their vision to keep every kid healthy, active, and ready to learn." For more than 12 years, Lobelo’s research has focused on chronic disease prevention, physical activity, obesity and cardio-metabolic diseases in high and low-to-middle income countries. In addition to training and preparing future public health leaders in this area, he has authored more than 80 peer-reviewed scientific publications. He is also a member of the American College of Sports Medicine’s Exercise is Medicine Initiative advisory board.